Sonnenblick, LLC Robert completed over $1.5B of commercial real estate transactions on the west coast. Among the most notable include: Beaudry Center, LA ($197M), The Ritz-Carlton Hotel, Pasadena ($97M), One Waterfront Plaza, Honolulu, HI ($100M) and the LA World Trade Center ($55M). He was also an original development partner of the $90M Loews Santa Monica Beach Hotel, which sold for $125M. Mark leads Panattoni’s operations in LA and San Diego. With 150M SF of completed projects, Panattoni ranks among the top industrial developers in the US. Prior to starting Panattoni’s LA and San Diego ops in ’09, Mark launched Panattoni Europe in ’04. Under his leadership, it grew to 120 employees, 12 offices, and a 97% leased portfolio. While there, Mark led the development of 12M SF of industrial and retail projects. Kristina leads all off-campus real estate development and construction projects as well as preparatory work for on-campus real estate projects exceeding 20k SF. She also oversees all campus planning activities, including the master-planning processes on both the University Park and Health Sciences campuses, and work associated with USC’s plans to develop a biomedical research park on the Health Sciences campus. Under Scott’s leadership, HKS Los Angeles has over 2M SF in design and 1.6M SF in construction. Notable current projects include a new replacement hospital at Camp Pendleton, the restoration of 50 United Nations Plaza, a 40 story condo tower in San Francisco. HKS is in design and construction on three major projects with USC, has ongoing work with Kaiser and Cedars Sinai, a casino retail project in Macau, China, as well as several hotels and office projects throughout Southern California. Andrew leads District procurement functions. He is responsible for the coordination and communication of design-related activities between the architectural, engineering, estimating and operations team. He coordinates and communicates all design requirements and program modifications. Previously, he served with Clark Construction as mechanical electrical and plumbing coordinator, and Berg Electric overseeing field operations. Robert oversees the integrated service delivery of CBRE’s global platform to property owners and investors in LA, Orange County and the Inland Empire. He provides regional oversight for asset services, project management, investment sales, debt & equity finance and agency leasing. He previously spent more than 12 years at GE Capital/Arden where he was Executive VP of Operations and Leasing before becoming COO. He most recently was COO at Younan Properties. What innovative methods keep projects moving? What are some of the new financing strategies? What impact does sustainability have on the future of development? How does one go about renovating existing assets? How is the SoCal market different than other business centers? 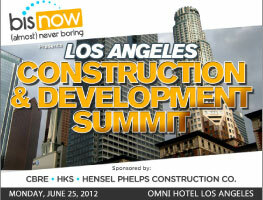 Join Bisnow and construction & development community leaders and advisors to gain invaluable information, insight, and (of course) schmooze time.